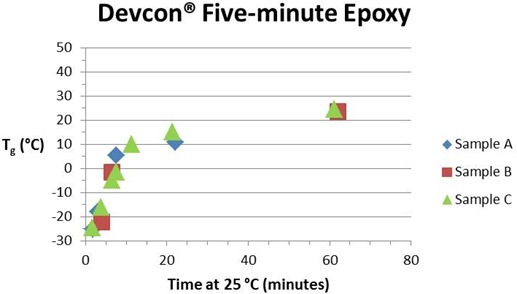 In the previous post we listed the characteristics of 5-minute epoxies as described on their packaging and we showed MTDSC data for Devcon® and Gorilla® 5-minute epoxies illustrating the complexity of their cures. 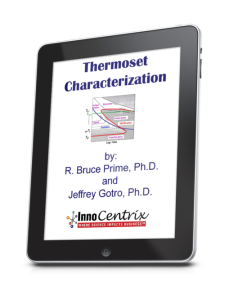 In this post we describe the further characterization of these epoxies from Tg – time curves at 25 °C, plus observations of physical changes over a 24 hour period after mixing. 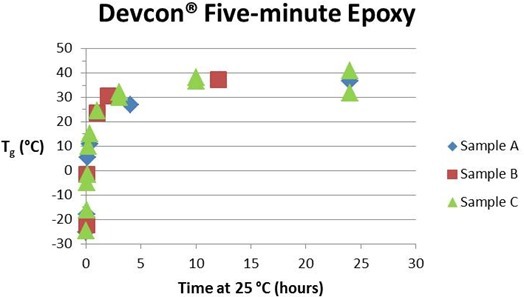 The two graphs below show the advancement of cure as measured by the increase in Tg at two different time scales for the Devcon® epoxy. 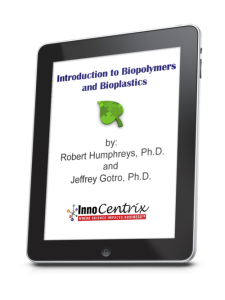 Samples A, B and C refer to the three packets of this epoxy as explained in Part 4 of this series. A number of observations can be made. First, the maximum Tg, which we associate with full cure, is not reached until about 10 hours at 25 °C (77 °F). 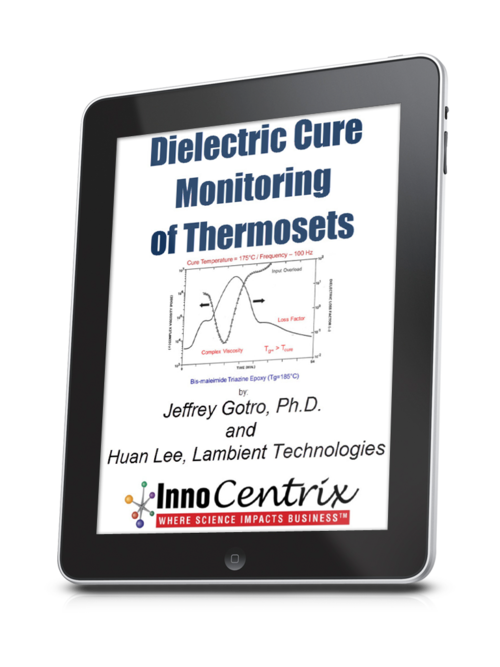 From the rule of thumb that the reaction rate doubles for a 10 °C increase in temperature we would expect full cure to be achieved in about 5 hours at 35 °C (95 °F) and in about 20 hours at 15 °C (59 °F). If the reaction is significantly slowed by vitrification at this temperature the time will be even longer. The Tg – time curves have the shape of an nth order reaction with the maximum rate at t = 0, not the autocatalytic shape typical of an uncatalyzed amine-epoxy reaction (see QiDSC curves in Part 3). We attribute this to the presence of a catalyst added to speed up the reaction with the result that second order kinetics dominates (Eq. 1 in part 3 with n = 2 and k2 = 0). From the asymptote of the Tg – time curves the ultimate Tg is taken as 37 to 40 °C (see Table I). 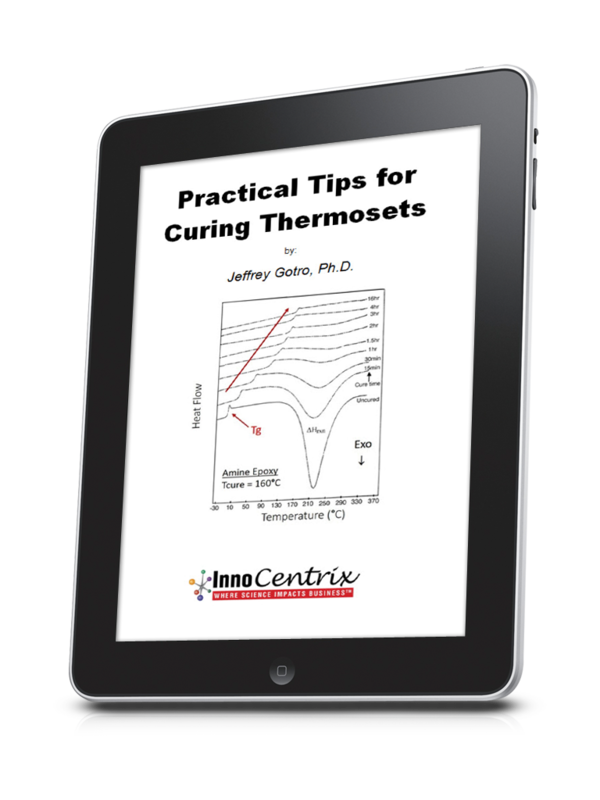 As long as the cure temperature is in the vicinity of 25 °C or higher vitrification is unlikely to significantly slow the reaction before full cure is achieved. 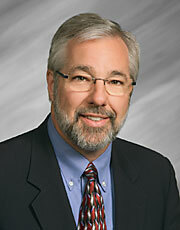 However, when cure occurs under much colder conditions vitrification may significantly prolong the completion of cure. With only a couple of exceptions there is little scatter in the Tg values, suggesting that we achieved a relatively constant 1:1 mix ratio. 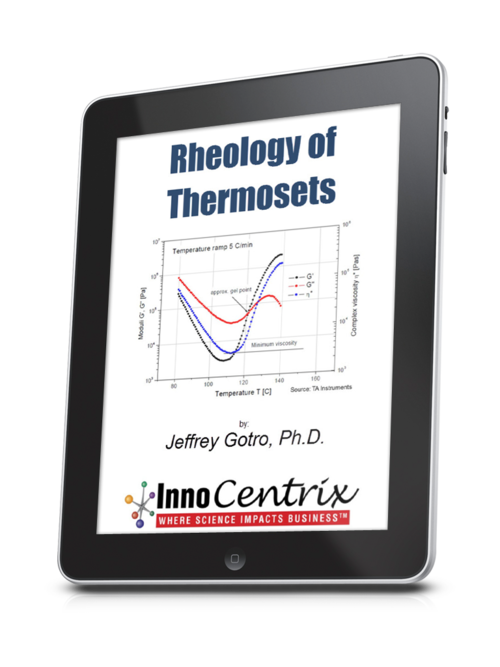 Where there is variation Tg tends to be low, suggesting that in these instances the mix ratio and therefore stoichiometry is off. The final figure below shows that there is considerable scatter in the DH vs. time data. We attribute this to difficulty in drawing an accurate and reproducible baseline for this complex reaction, and conclude that Tg is a more accurate measure of cure than is conversion from DH for the five-minute epoxy. DH vs. time (hours). DH is the sum of the exotherms for all three reactions. Sample C.
Table I below lists Tgs achieved for various times at 25 °C. Where not measured directly values were interpolated from the plots. The Tg of Devcon® 5-minute epoxy did not increase beyond 10 hours at 25 °C and this is taken as the time to reach Full Cure at this temperature. Gorilla® 5-minute epoxy, on the other hand, required 24 hours before full cure was reached. Table I. Tg (°C) of 5-minute Epoxies after Various Times at 25°C. Times listed are after mixing time of 1½ to 2½ minutes. In Table II below we describe the physical state of the two different 5-minute epoxies. Equal beads were extruded onto squares of aluminum foil and vigorously stirred with a toothpick. From continuous probing and from embedding half a toothpick vertically in adhesive we were able to make the observations in Table II. As described in our previous post the packaging of these epoxies gave somewhat different information on the expected progress of cure. 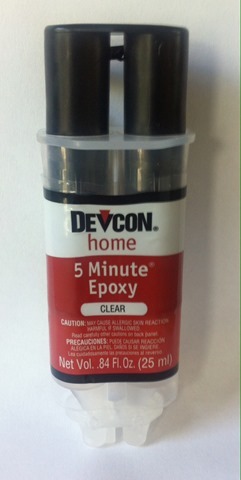 Observed State of 5-Minute Epoxies over Course of Cure at 70 °F (21 °C).Times are after the start of mixing. 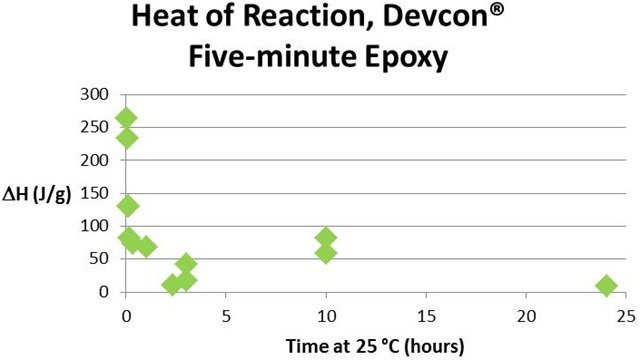 Devcon® epoxy gels abruptly between 5 and 6 minutes and no longer flows, whereas the Gorilla® epoxy gels more gradually, is still liquid at 10 minutes, and gels at about 15 minutes. Devcon® continues to cure more rapidly reaching full cure by 10 hours. Gorilla® has not reached full cure until 24 hours. In our next and final post in this series we present MTDSC results for a 60-minute epoxy and compare it with the 5-minute epoxies. Devcon® is a registered trademark of Chemical Development Corporation; Gorilla® is a registered trademark of Lutz File & Tool Co.